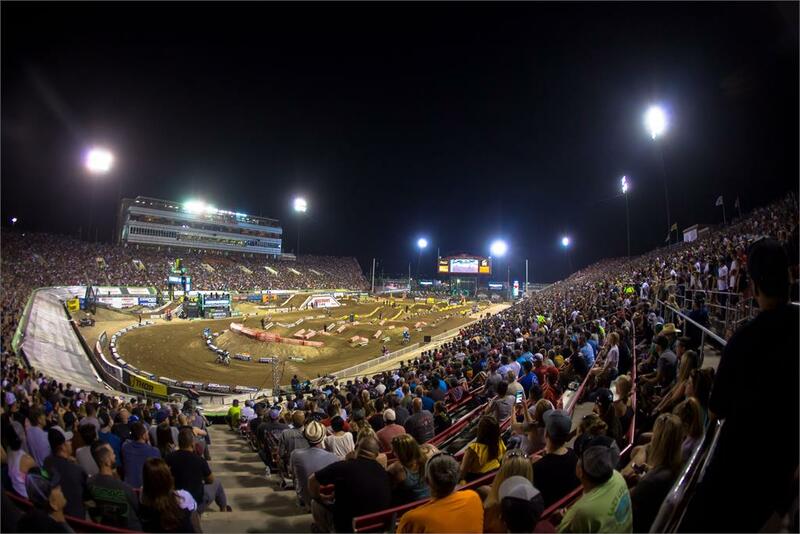 The Autotrader/ Yoshimura/ Suzuki Factory Racing team stormed into Sam Boyd Stadium in Las Vegas, Nevada for the final round of the 2018 Monster Energy AMA Supercross Championship and Suzuki RM-Z450 mounted Weston Peick scored another top-10 finish to end the series in sixth overall. In the 250 class, team-mates Justin Hill and Kyle Peters also battled hard to finish sixth overall in their respective regional series’. In front of 39,509 fans, and on television screens around the world on Saturday night, Peick rode with determination in moving through the field to finish seventh. The SoCal native finished inside the top 10 in 13 of the 17 rounds, including four top-five results, in scoring sixth overall for the series. Malcolm Stewart was aiming for another top-10 finish in his last fill-in ride with the Autotrader/ Yoshimura/ Suzuki Factory Racing Team. Showing flashes of brilliance like he has so many times before, Stewart was riding a solid third place in his heat race. Unfortunately, he crashed on the last lap and ended up fifth. The impact from the crash held him back in the Main Event, where he finished 13th. Stewart finished 11th in the overall standings, despite missing the opening round of the series. Defending 250 West Supercross Champion Justin Hill had high expectations to end the series with another win. The Oregon native was hampered by an ankle sprain sustained during last week’s race in Salt Lake City, but he soldiered on to a 15th place finish, and ended up sixth overall in the 250 West series. Against all odds, Suzuki RM-Z250 rider Kyle Peters scored a podium finish in Foxborough two weekends ago while racing with a torn ACL and MCL in his left knee. Peters gave it his all in Las Vegas, but the injury held him back from another podium. He finished 18th in the Main Event and sixth overall in the 250 East Supercross Championship. Peters will undergo knee surgery this week to repair his ligaments. Phil Nicoletti was eager to finish his 250 West campaign on a high note, especially after scoring a sixth place in Salt Lake City. Unfortunately, Nicoletti was plagued by misfortune at nearly every turn and failed to qualify for the Main Event. The New Yorker ended the series in 11th overall. He will now turn his attention to the Lucas Oil Pro Motocross Championship in a fill-in role for the injured Justin Bogle on the Suzuki RM-Z450. This concludes the 2018 Monster Energy AMA Supercross Championship. The Autotrader/ Yoshimura/ Suzuki Factory Racing Team will have a weekend break before traveling to Rancho Cordova, California for the opening round of the 2018 Lucas Oil Pro Motocross Championship on Saturday, May 19th.